“As Mike’s wife I’m always being asked by artists at his workshops if I am an artist too, but I haven’t drawn or painted since I was about twelve years old. We had a spare place in the July workshop, so I decided to take it. The first day I worked my way through all the exercises alongside everyone else, and then began the main drawing of the workshop in the late afternoon. 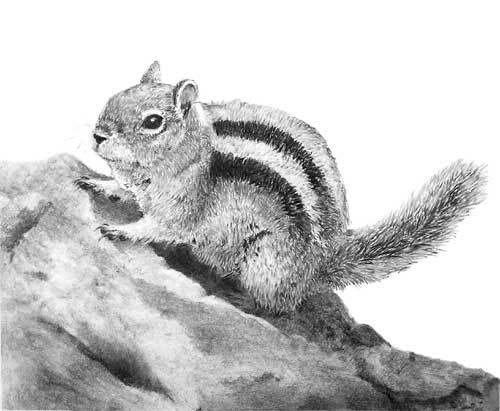 I chose to draw a Golden Mantled Ground Squirrel that Mike photographed in Yellowstone Park, when were there in June to hold his 5-day workshop. My drawing is about 6″ × 5” and Mike drew the guide-line drawing for me, as he does for every artist in his workshops. I don’t have a lot of patience and thought I would quickly become bored but, once I began drawing, the time went so quickly. Everyone was lucky to get their lunch (my department) and cake! The next day I really couldn’t wait to get started on my drawing again. Although I’ve watched Mike draw for almost 30 years, I never thought I’d ever try it myself – and now I want to begin planning my next one! Mike didn’t help me more than anyone else during the workshop and fortunately, unlike husbands teaching wives to drive, he has enough patience for both of us. What’s next?? A Donkey… because I can’t persuade Mike to draw one. I hope you agree with me that Jenny’s drawing is something she should be justifiably proud of – I know I am.